UK-based Actisense, using their knowledge of NMEA product designs, unveils its EMU-1 electronic engine monitoring unit. The demand for greater speed and the ability to share information across a greater volume of instruments led to the development of the newer NMEA 2000 standard which has been developed to supersede the NMEA 0183 serial data bus. This standard is able to connect various instruments along a single backbone, allowing one display unit to show many different types of information. 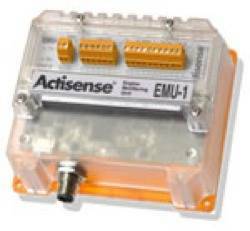 As NMEA specialists, Actisense have developed a cost effective Engine Monitoring Unit (EMU-1), which creates an ‘analogue to NMEA 2000 gateway’, easily configurable and flexible enough to run alongside many engine makes and models. The EMU-1 will convert engine parameters such as temperature, pressure tach and RPM into the corresponding NMEA 2000 engine PGNs. Taking advantage of the engines common ground for all its inputs, the unit can allow each to be a single signal wire. The unit is able to handle 6 gauge/ parameters inputs, 4 alarm inputs, 2 tach inputs and 2 additional auxiliary inputs. If an installation has two engines that share a common ground then a single EMU-1 can be used to convert both engines. Typically however, there will be only one unit per engine. Andy Campbell, Chief Engineer commented ‘The EMU-1 has been designed with simplicity in mind. This will change the way analogue to NMEA data conversions are done. This product meets the rigorous demands of a marine environment and we are sure that it will become highly sought after in the trade’.